Terry and Davene are high school sweethearts. The kind that make you wish you'd known your love since you were a kid. After 8 years, two beautiful kids, and all kinds of crazy life happenings... they're getting married! Davene has been my best friend for years, so when she asked me about doing engagement pictures, I was nervous and excited. Excited because, well duh. But nervous because I wanted them to be perfect. 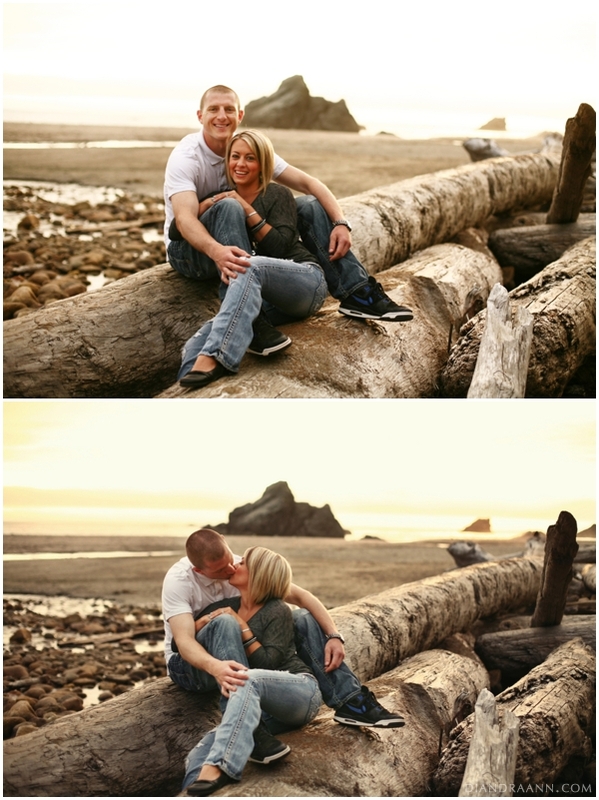 I was able to go back to my home town of Brookings, Oregon and shoot around the area with them. From a field overlooking the Harbor Port, to an abandoned building, to the beautiful Harris Beach State Park, Brookings is home to some of the most beautiful scenery I've ever seen. Sometimes the scenery can make as big of an impact as the props and outfits. That was definitely the case in this session! 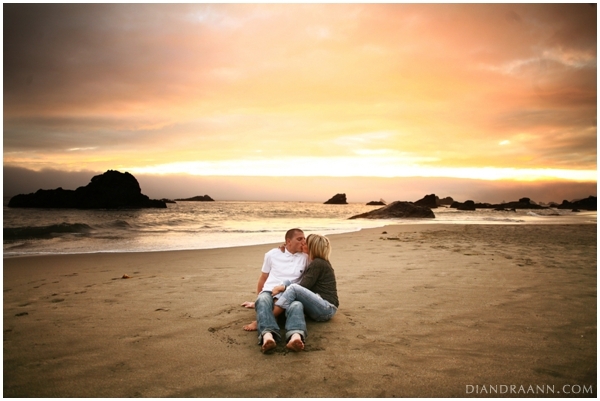 Diandra, thank you for sharing this lovely session with me! From the bride:I was born in Visalia, CA and moved to Brookings, OR in the 1st grade. I've pretty much been here ever since, excluding those short need to get away moments : ) Terry was born in Crescent City, CA and has spent his whole life in this area. I am a registered dental assistant. Terry is the co-owner of a local furniture store, Barron's Home Furnishings. We have two beautiful children, Trent who is 3 and Sawyer who just turned 2. They keep us very busy and are our number one priority. Family is very important to us. We take every opportunity to spend time with them. We love camping, doing water sports at the lake, going on date nights, and Mexican food! We'd been together for almost 4 years and were on a family camping trip. Everyone knew he was planning to propose to me, except ME!! He had been paying on the ring for awhile and had kept it a secret. We were sitting around the camp fire with family and friends when he got up and left for a little bit. I didn't think anything of it. But when he came back he kneeled down on one knee next to my chair. I wasn't sure what he was doing because the rocks on the ground were huge and definitely not comfortable. Then he reached into his pocket and I said "shut up"!! It had finally dawned on me what was happening and I was so surprised! I remember like it was yesterday... He said "Davene, I love you very much. Will you Marry me?" Of course I said yes! It was all caught on video camera too! But the only bad thing was I was in a sweat suit with fluffy socks and flip flops!! The best night of our lives. And we are constantly reminded because this is the same spot that we camp every summer : ) it wasn't a fancy, over the top proposal- it reflected exactly who we are and what is most important to us. Absolutely beautiful couple! 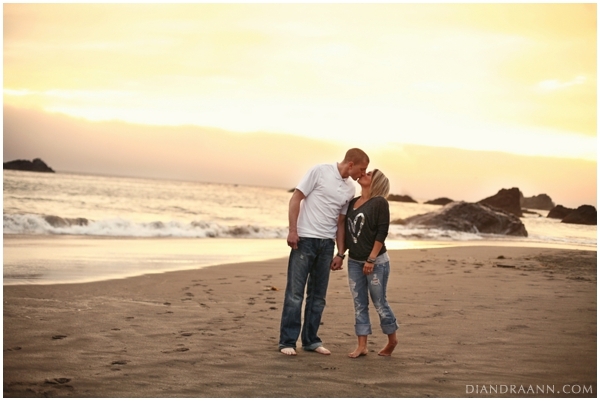 I am a huge fan of Diandra's gorgeous photography, what a sweet shoot! Wow, I love this beach location with the HUGE driftwood! And the gorgeous setting sun... beautiful! !